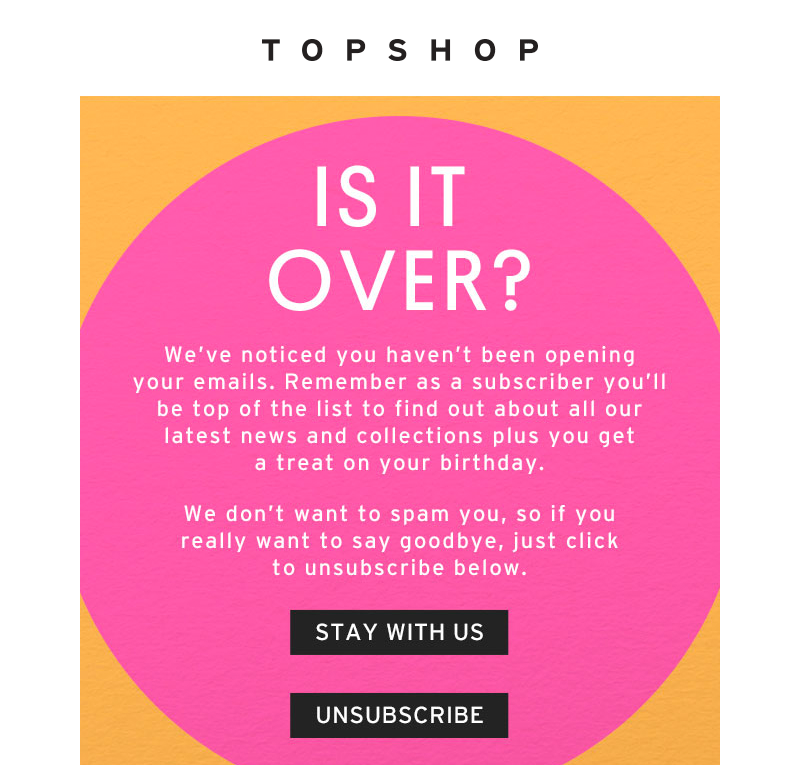 Every email you send is an opportunity to raise awareness of your brand or product, so make the most of one of the last opportunities you’ll have to email all your subscribers. With a little time and effort, you can invite users to re-confirm while raising a smile and remind them why they signed up to your mailing list in the first place. Battersea Dogs Home is an animal charity based in London. 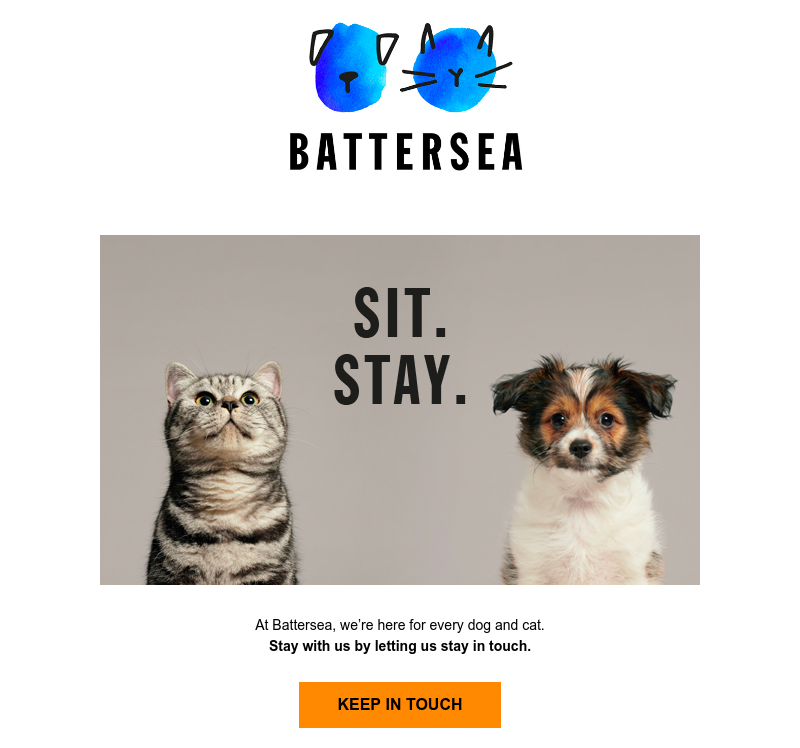 Their subject line of “Sit. Stay with us” is a great example of how you can closely align a re-permission campaign with your brand and product, while making it fun at the same time. The Barbican is another great example. The arts centre, which is within an architecturally renowned complex, ran with a number of puns based on their location. 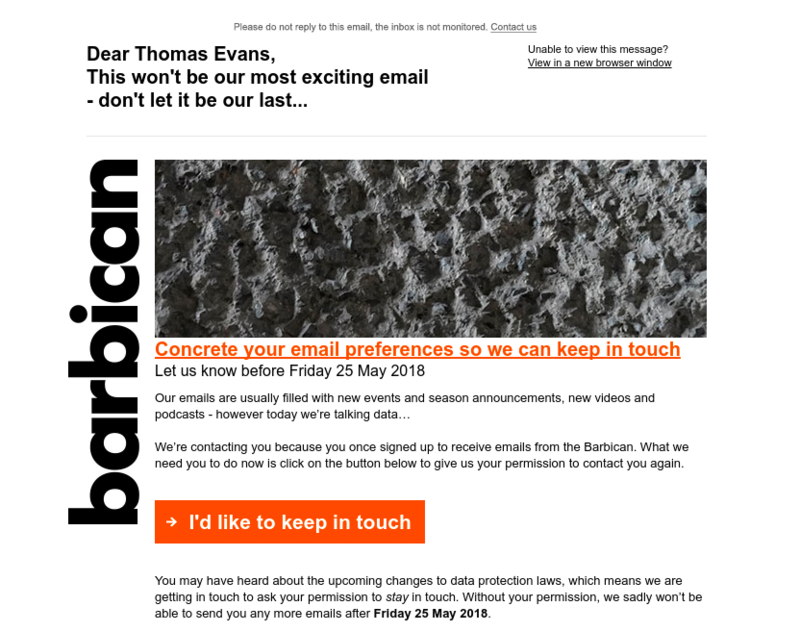 The subject line “Don’t be brutal – stay in touch” nods to the style of the brutalist structure and the headline references the concrete which makes up much of the building. To many organisations, the prospect of losing the majority of their mailing list is a scary one. 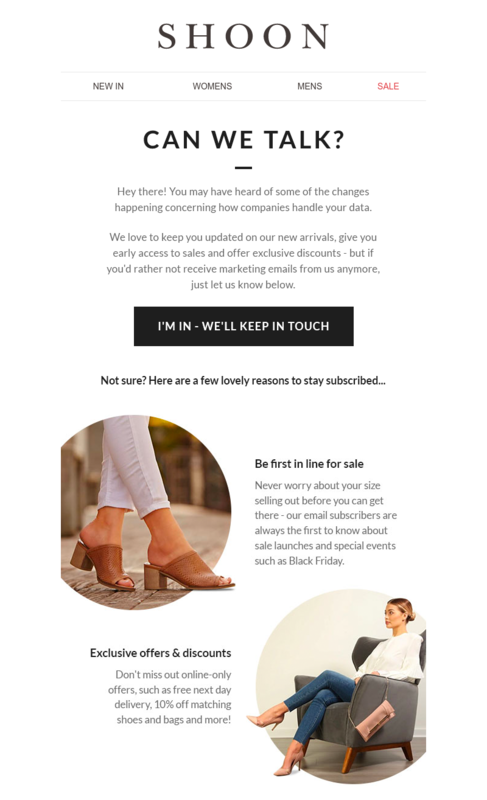 Some companies we’ve worked with attribute upwards of 70% of revenue to email marketing; for them, it’s worth money as well as time to encourage users to remain on their list. 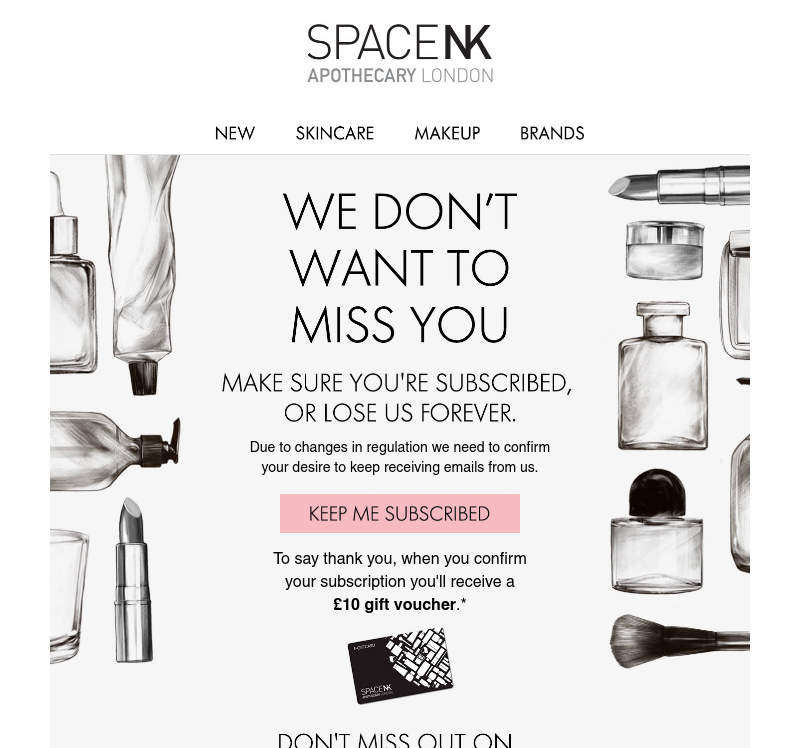 One example of an incentivised campaign is from Space NK, where presumably the lifetime value of having a customer on their mailing list exceeds the cost of the incentive offered. In the example below, the luxury beauty product retailer is offering a £10 gift voucher to all users who confirm their subscription. If you’re not keen on an incentive and a witty campaign doesn’t align with your brand, then you should at the very least explain why users should re-confirm. There are likely genuine reasons that customers will want to remain on a mailing list, so sell those reasons. Perhaps they get early access to sale products or get the latest updates before anyone else. Your campaign should explain those benefits, just like the following example from online footwear retailer Shoon. This goes without saying, but make sure you make it clear what you want your subscribers to do. Below your text, be sure to include at least one large button inviting them to re-confirm. Topshop, in the example below, increase prominence through size and contrast. Their large black ‘stay with us’ button is impossible to miss. During their most recent football (soccer!) 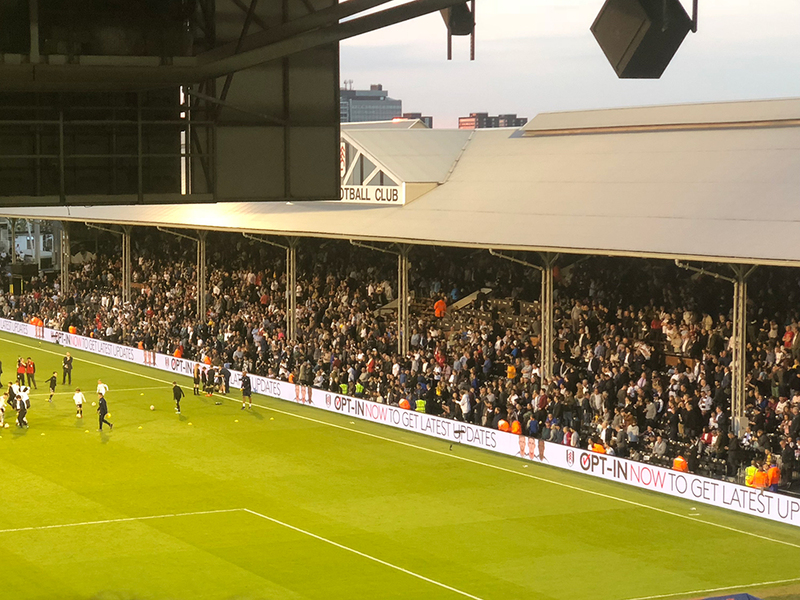 game against Derby, Fulham made use of their perimeter advertising boards to encourage fans to re-opt-in to their email list. This was the biggest game of the season – the play off semi-final – and boards would have cost upwards of £3,000 per minute to advertise on. The advert ran for most of the game which shows just how valuable a large mailing list is to Fulham. You probably don’t have advertising boards or a televised Sky Sports spot, however, re-confirmation campaigns can be more than just an email. Your website and social profiles can be good channels to re-engage customers who have missed your email in their crowded inbox. Why not try exporting your subscribers who haven’t yet opted back in, and then target them on Facebook using custom audiences? We’ve collected the 50 or so emails which we have received and shared them the website LookAtThatSaaS. Complete with screenshots and subject lines the selection will help you get over even the biggest creative block.